A memorable tour from start to finish. In 4 hours we saw all the major points of interest in Montevideo and many extras as well. Michele is knowledgeable, personable and adaptable which made the tour extra special. We actually got 2 guides for the price of one and they were each able to contribute in their areas of expertise. Traveling would be even more rewarding if all guides lived up to Michele's standards. Tours do not get any better. Informative, caring, and fun. Like being shown around by a close and dear relative. She obviously loves her city and country and shows it to you from that perspective. Also, excellent English. Michelle is a super tour guide. Our ship changed its schedule and Michelle adapted our tour extremely well. She knows her city and is proud to show it off. She is very personable and we all enjoyed ourselves. She escorted us to the winery in a very comfortable van with a highly professional driver. I can't say enough good things about Michelle and this tour. I have recommended her to others travelling to Montevideo and will use her when we visit again. Good tour of Montevideo. Michelle knows her stuff! Michelle was really interesting speaking about her city.....tour guides who are exciting make a tour ! Michelle was so knowledgeable, spoke clear English, and knew the political information that we would never have gotten from any other guide. Our tour was private to the four of us and we could ask questions and get answers from Michelle. Michelle was so concise, clear, informative and cheerful! Another thing, I had informed Michelle that my husband had COPD and Michelle as very caring of him and we really appreciated the loving care Michelle took with him. Michelle and Gabriel were fabulous, very knowledgeable about Montevideo and passionate about Uruguay. They were patient and spoke impeccable English. Our group thoroughly enjoyed the tour. Muchas gracias! Michelle was the perfect guide for us, so easy to correspond with and arrange what we had in mind in advance of the tour, perfectly described where to meet her, was there waiting for us and gave us such a wonderful visit to Montevideo. She is so knowledgeable and gave us so much information in such an interesting way. We saw far more of the area and gained so much more than if we had made the tour on our own. Michelle is a very cheerful person to be with too, we all totally enjoyed the time and views. Michele was excellent and gave us a very through and efficient round down of Montivideo. My husband and I spent Christmas morning with our wonderful guide Michelle V. Her English was excellent, she was extremely pleasant, and very knowledgeable. A great tour - 5 stars! Michelle Vasen was excellent. She did everything within her power to ensure we enjoyed our tour. She's very accommodating, always willing to tailor the tour to suit our request. Also, her driver, "William" was great. We can go on with specifics, but we highly recommend Michelle. Thanks Tours By Locals for hiring Michelle, and a BIG THANKS to Michelle. Michelle gave us an excellent overview of the city with lots of historical and cultural information. Her English is excellent and she is proud of her city. Michelle was a fabulous guide - very knowledgeable about Uruguay history. Her husband, Gabriel also came and both were a fountain of information. Professional, prompt, excellent English, friendly - would highly recommend. She went above and beyond. Michelle organised a bespoke tour of street food and bakeries as we requested. It was well organised and a pleasure driving around Montevideo with a driver guide in a comfortable car 8 seater bus. Michelle, along with her husband Gabriel were very helpful and accommodated my every request. Both are retired professionals, very good English and have great knowledge of the area. I highly recommend for anyone who wants to visit Montevideo and surrounding area! Interesting tour by a knowledgeable local guide. Gave us a very good overview of Montevideo. Would not hesitate to recommend her tour. This tour changed from our original booking because the winery tour increased in duration and cost. The city tour was very good. Michelle was very knowledgeable and helpful. Her recommendation for lunch at a local restaurant was excellent. Michelle did a very good job showing us the sites of Montevideo and giving us some great perspectives on the city and Uruguay. Michelle went out of her way to provide us with a great tour. It was just unfortunate that everything conspired against us. The ship was very late, the weather was terrible and it was too dark to see much. But, I would still recommend Michele totally to anyone, anywhere. Michelle was lovely and we enjoyed spending the day with her. Fortunately, her husband (also a guide) accompanied her, as she had a foot injury. He also could fill in with some missing gaps of knowledge, which admittedly were not part of the tour but just our specific interests. We were a party of four arriving by Oceania cruise ship. Michelle promptly met us at the cruise port and we headed out for our tour. We toured beautiful Montevideo where Paula showed us the highlights and gave us a history of the city. We then headed out of the city to the Bouza Winery. We had a tour of the winery which included an outstanding and elegant lunch with wine pairing. We had a wonderful day with Michelle and would highly recommend. Michelle and Gabriel are lovely people who made sure our needs were met. They are well versed in the history of the city and were most accommodating. I was very pleased with her tour. She is very knowlegable and is very easy going. Beautiful if you like to see all of the scenery and don't mind long rides. We loved it and saw what no one else did. Michelle was there to meet the cruise ship. We were able to see multiple sights and had a wonderful local lunch. We were returned right on time. Michelle is an excellent guide and took great care of us - even taking me to a pharmacy to get treatment for my blisters ( not caused by this tour!). She ensured we saw all the sights of Montivideo - a beautiful city - in comfort and at a pace to suit us. We recommend Michelle as a great guide. We enjoyed an amazing lunch in the port market at a place suggested by Michelle. No complaints about the tour. Michelle did a good job f showing us around Punta del Este. She gave us a variety of looks at this beautiful city. Michelle is the perfect example of a model tour guide and superior in every way to all the five others we employed on our tour of Southern South America. Michelle went out of her way to make arrangements for our special and unorthodox requests and was able to manage this for our New Year's day tour. She is a profe Michelle was thorough in her guidance and in answering our questions. We vividly recall the many interesting things we accomplished and wholeheartedly recommend her to everyone. We thoroughly enjoyed our Jewish Cultural Tour of Montevideo with Michelle. Her knowledge and enthusiasm were contagious. In addition to showing us the synagogues of Montevideo and explaining the history of Jews in the city, she also showed us many other features of Montevideo's history and current culture. Even after the tour was over, she stayed with us on her own time to show us the Mercado near the port. 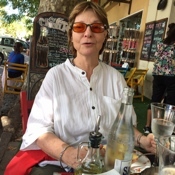 My wife and I were lucky enough to have Michelle guide us through Montevideo December, 2015. My wife and I are both Architects. We enjoy architecture, history, culture and art. Montevideo has all of this and we were VERY fortunate to benefit from the broad experiences/knowledge of Michelle. She is intelligent, insightful, interesting, hospitable and gracious. Highly recommended tour and tour guide. It felt like we were visiting family... really. TOUR GUIDE RESPONSE: Hi Kerry and Linda, thank you so so much for your great review! You were so engaging and wonderful to spend time with! It was really nice meeting you I would have stayed hours showing you more and more. Wow, I also felt the same! I wish you the very best for this New Year, happy, healthy and wealthy. Come back soon! Warmest regards. Michelle was an excellent guide for our tour of Montevideo & Punta del Este the next day. She is knowledgeable and goes out of her way to help the group, which consisted of 2 very senior travellers. Her English is not exactly fluent but if you are slow and clear, she picks up and responds adequately - a very minor distraction, that requires patience. Otherwise, recommended. Michelle was prompt and informative. Some of the city highlights could not be visited due to the planned inauguration of the president and city buildings were closed. We visited a nice winery, Bouza, which included a tour and wine tasting. The wine tasting did include a charge of $20 per person but was worth it. 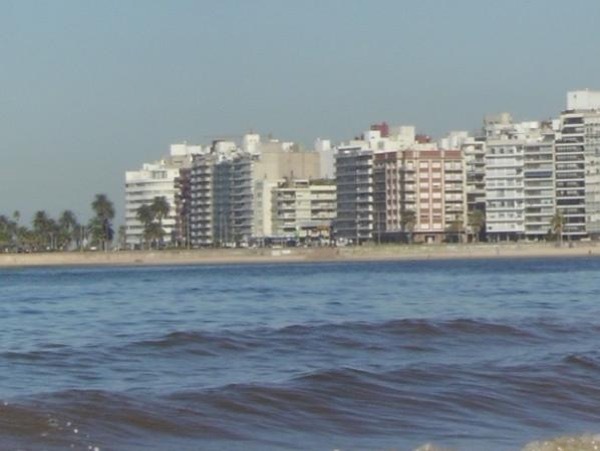 A recommended tour of Montevideo. Michelle was very knowledgable, friendly and did her best to provide us with a informative tour. Pleasant, informative, answered all our questions about Montevideo and Uruguay. When we return we will hope to have another great experience with Michelle. P.S. Thanks helping us pick out the Mate at the market. Michelle welcomed us at the port and soon we were ion our way in a Van and Driver to tour many spots in Montevideo. One of the highlights and a must when visiting Montevideo is the Bouza Winery tour. We are in the restaurant business and have toured many Wineries, but this one was the most informative and so well done down to the last drop at our tasting table. Michelle Thank you for a delightful day. We had such a peaceful time at the winery and we thoroughly appreciated the information you both provided about the region and the history. Great day Thank you both. Very cordial but we felt that our tour was lacking in enthusiasm. TOUR GUIDE RESPONSE: Hey Janet, it was great meeting you. This review took me by surprise, since this is the first time I have ever heard that one of my tours lacked enthusiasm. I remember that day being very hot so the heat could have affected me in a way that I didn’t notice. I am sorry about that! Michelle gave us a great tour of Montevideo. She is charming with good English. I would recommend her. Michelle was knowledgeable and a great guide. Our ship was 4 hours late in arriving but we managed to communicate via email and she adapted the change. Great job!! My husband and I without question give this tour a 5 star rating. The tour guide Michelle and her husband Gabriel (also a tour guide), who accompanied us for part of the tour, could not have been nicer or more knowledgeable about their city and country. They went out of their way to fit this tour in for us as they were booked for our date several months in advance. They took us all over and talked of history, styles of architecture, political history, and local highlights. They were great. Due to the late arriving of the ship had to juggle and Michelle handled it well. Very knowledgeable and we had a great day!!! We thoroughly enjoyed our day with Michelle, touring Montevideo. Her knowledge of the city is deep, her enthusiasm for her home is contagious, she is sensitive to her guests' interests and adapts her tour to them, and being with her is simply a delight. We highly recommend Michelle as a guide for Montevideo! Michelle was very accommadating. Unfortunately, we never went into a Sephardic synagogue but only drove by one. Time was well allocated. TOUR GUIDE RESPONSE: Louis, thanks for your review. Nice meeting you. We visited the Ashkenazi Synagogue, the most important and representative with a guided visit for almost an hour. I specially contacted for you and Rabbi, Director Culture Dept. who kindly showed us around the Holocaust Survivor's Museum the synagogue itself, the Dissability Dept. and others which are part of the great job this Community offers. We did see all other important sites. My Jewish Tours are designed to enter just one synagogue. Best to you all!! TOURSBYLOCALS RESPONSE: Michelle was surprised by this review and informed me that she not only booked a visit to the Sephardic synagogue in advance but that she visited the Sephardic synagogue with the customers. I forwarded a note the Michelle sent me pointing out the fact that they visited that synagogue and they recognize that and apologized for the confusion. We spent a spectacular day seeing Montevideo with Michelle during our recent cruise. The experience began prior to our arrival, when Michelle was very helpful in designing our itinerary. We arrived at the pier early but Michelle was there smiling and ready to go. It was a Sunday so not everything was open, but she gave us a deeply insightful sense of Jewish history and life in the city as well as the culture around it. Michelle made it seem like we were visiting family... and in some way, we were! A well prepared tour and Michelle is very pleasant and helpful. Michelle is knowledgable and personable. She would make an especially good guide for someone with limited mobility, or elderly cruise ship guests who need to see the city at a slower pace. Michele provided us with an informative and insightful tour of Montevideo. Very informative and accommodating showed a variety of classes of housing areas from now to passed ages . Excellent value. Will use again in other places. We very much enjoyed the tour today and saw much of Montevideo. The guide went to great lengths to keep us informed and we felt the tour was eccellent value. I believe Michelle had some sort of accident prior to our tour taking place and was therefore slowed down a bit. However, her husband accompanied her and we found him to be extremely knowledgable. Overall we enjoyed the tour and would give it 4 1/2 stars. I have already made a comment on this tour. TOURSBYLOCALS RESPONSE: Traveler comments were passed on to Jay's guide support manager who will re-assess his English skills accordingly. I found this tour to be a bit boring, & it went on for far too long. Possibly my fault for choosing this particular one. Wonderful time. Very informative and we went several places ship tours didn't offer. Great for small groups who want personal service. Michelle is very knowledgeable and was very accommodating. Michelle was one of the most knowledgeable tour guides we had. Due to some eye issues she has, she travels with an assistant to help her. This was an added bonus for us--the more the merrier! We learned so much about Montevideo, Uruguay, and saw the main sights along the way. Michelle is an enjoyable person to be with and made our tour very special. I cannot undermine the positive effect of Michele and Gabriel in the success of our Uruguay visit with guidance on hotels, transportation and place to visit. They helped us to find transportation and hotels on our planned visit the country's interior. They were kind, friendly and supported us on any need: shopping, restaurants, even bureaucratic issues. We toured 3 locations at touristic and less usual sites. The excellent explanations provided a different and interesting perspective of Uruguay's history. TOUR GUIDE RESPONSE: Dear Igal and Rachel, we thank you for your kind words and nice review. It was certainly our pleasure meeting you and being of any help, it's our goal. You are real special people and we do hope to see you again. We enjoyed every moment spent together. Our best regards to your parents and a big kiss for you both. Michelle and her husband Gabriel (who also is a Tours-by-Locals guide) both gave us the tour of Montevideo. Although Michelle is a very sweet and kind woman, she cannot really guide anymore secondary to her eyesight. She did provide nice details of the sights we visited though. Gabriel got us in to see the Montevideo Naval museum, despite the fact it was closed. Gabriel was the driver, and he drove a rental car. The driving was erratic, jerky and frightening. We cannot recommend this tour. TOUR GUIDE RESPONSE: We are surprised and sad with this review, we feel the review is unfair. We have an exemplar track record to back us up. The passengers could have expressed their dislikes during the tour and we would have been glad to pleased them, that is our goal, that is what we do everyday. Michelle only delivers tours she is sure that she is capable of delivering and as per the driving, in our country the traffic is disorganized and we went back to the airport during rush hour, so there were traffic jams everywhere. TOURSBYLOCALS RESPONSE: The issues stated in this review were brought up to the guide and the guide's manager attention. Michelle was a very good guide who ensured we saw as much of Montevideo as possible.We learned a lot about Uruguyan history which was interesting.She was friendly and a very pleasant lady. We very much enjoyed our time with her. TOUR GUIDE RESPONSE: Hi Chris, yes, you are right. The tour was supposed to be a 6 hour tour and we only did 3, half of it. You didn’t see the best part. Unfortunately, because of the unusual hot day we had on the day of the tour, plus one of the passengers didn’t feel well since the beginning of the tour you chose to get back to the cruise. Thanks to Gabriel stepping in to Michelle's shoes at the last minute we had a great day in Montevideo. Michelle couldn't take us on our tour due to ill health (hope you are feeling much better Michelle)instead her husband Gabriel took us and showed us around. We saw so much more than we ever would have left to our own devices, it was a terrific tour covering the history and architecture of Montivideo. A day well spent. TOURSBYLOCALS RESPONSE: Gabriel and Michelle are both ToursByLocals guides and in circumstances such as illness are able to fill in for each other. Michelle and the driver were great. At the end of the tour, when we asked for a tourist shop for t-shirts, the driver took us back a distance and waited for my wife and I (she uses a cane) so she wouldn't have to walk back to the dock. This was above and beyond what we expected. Michelle is a very kind and caring guide. She also prepared a handout (take home copy) with some information about Montevideo, Colonia de Sacramento and Uruguay's history. Comparing her skills with the guides we had on our other three tours during our trip in South America, we must admit that she did not live up to the same standard of the other guides. Her knowledge about Montevideo seemed more profound than about Colonia de Sacramento. TOUR GUIDE RESPONSE: Andrea, I appreciate your review. It was nice meeting you. Comparing the history and heritage of such a small and lovely town as Colonia, it never had the rich and colorful histories and events happened in other bigger South American cities and places. Everything what I told you about Colonia during our tour is all what can be told about it and its place in Uruguay’s history. As you said, Montevideo a bigger city has much more stories to tell. Kind regards. Michelle is fluent in English and knows Montevideo inside and out. We had a tour of the city that was in depth and extensive. Most of all, she made me want to come back to explore the city in depth. She was able to smooth the language differences at the winery and made our day most enjoyable. TOUR GUIDE RESPONSE: Dear Carole, thank you so much for your nice and kind words. I really enjoy what I do and I truly look for ways to share the best of myself. I greatly enjoyed your company and I would have stayed longer. I hope you do come back soon so I will have the opportunity to show you lots more. A big kiss for you Carole and my best regards to your wonderful group. See you soon!! Enjoyed meeting Michelle - Unfortunate several museums closed. Feel this is a tour one can do easily on their own, but nice to talk to a local from the country. Reason for not giving this tour 5 stars. TOUR GUIDE RESPONSE: I thank you Donna for your star rating. It was nice meeting you. You are right. Colonia del Sacramento is a small city and can be visited on foot in around 4 hours, which is stated in my tour description. As it is an historic city, Colonia offers to the tourist different visits to museums. Unfortunately they take turns to close, so everyday in the week there are two or three closed. This is the way it is.